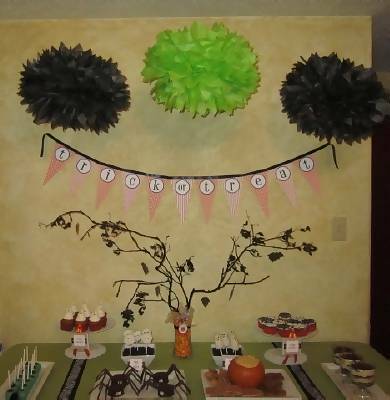 Use A Halloween Baby Shower For A Frightful Good Time! 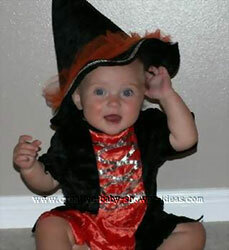 A Halloween baby shower can be a ghoulish delight in "witch" all of your guests will enjoy. Blend the harvest season with spooky fun in celebration of the new little pumpkin on its way! Cut out a cauldron using a template placed on black scrap booking paper. A baby is brewing! Come to a Halloween baby shower to celebrate (parent's names) new baby. Join us on (date), (time) for a ghoulish good time! Guess who's baby picture is whose!- Invite guests to bring a picture of them when they were a baby. Tape pictures on a big cauldron or another Halloween template. Guests will then guess which baby picture belongs to which guest. Halloween crossword puzzle-Create a crossword puzzle of Halloween items for your guests to figure out. You can use Halloween items or movies to give hints on what the crossword answer would be. Give a prize to the person with the most correct answers. Use pumpkins as your bowling ball and baby bottles for the pins. Fill the baby bottles with candy corn or another Halloween candy to weigh it down. Creepy Crawlers- Place different objects in bags for guests to feel and guess what they are. Make sure the bags are not see thru! Some items to use could be peeled grapes for eyeballs, and spaghetti noodles for brains. Use your imagination to create fun items for them to touch. Baby Sounds- Record baby sounds on a tape recorder for guests to guess. The sound must be related to a baby or an action that involves the baby. The person with the most correct guesses will win a prize. Some ideas would include running water for a baby bath, Velcro sound of a diaper change, zipper from a sleeper, sucking sound from pacifier, etc. Get more game ideas in our Halloween games page. Decorate for Halloween. Place cobwebs in corners and use the colors of orange and black. Place fake spiders, bats and skeletons around the room. Decorate with pumpkins, witches and harvest items. Use strobe lights and creepy Halloween music. 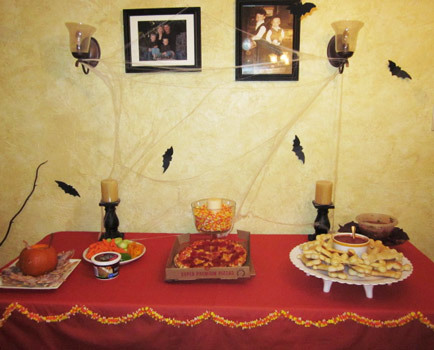 Decorate the food table with Halloween colors, cobwebs and spiders. Place a haunted welcome sign for your guests in the front yard. Decorate it with cobwebs, fake spiders and other Halloween fun items. 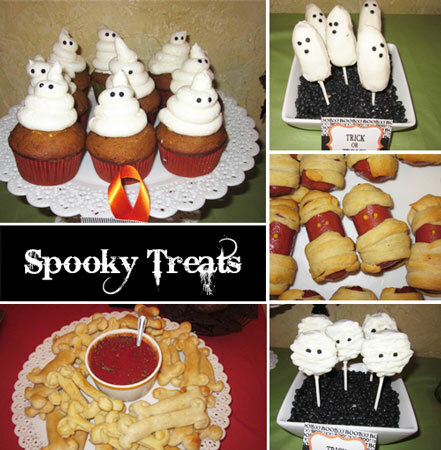 Create a terrifyingly tasty menu for your guests to enjoy. In the above picture from left to right I had halloween cake pops, pumpkin mousse cupcakes, hostess ding dong spiders, mummy chocolate covered oreo pops, pumpkin cheesecake dip, banana ghost pops, spiderweb cupcakes, and dirt cake. Use some brewed items to add to the fun. Place hearty stew in a cauldron. Offer a selection of hot and brewed items such as hot cocoa, cider, teas and coffees. Some other ideas are caramel popcorn, pumpkin bread, pumpkin cookies, and green bean casserole. Mix all ingredients except toffee bits together with hand mixer until smooth. Stir in about 1/2 a bag of toffee chips into the mixture. 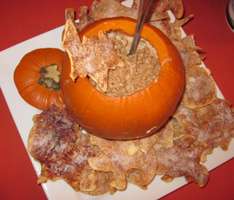 Serve in a hollowed out pumpkin. Sprinkle the top with remaining toffee bits. Serve with fruit or with bat chips like above. To make the bat chips, I just brushed tortillas with butter and then sprinkled with sugar and cinnamon. 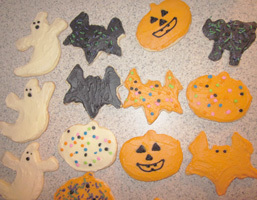 Then I cut out the bat shapes with cookie cutters and baked until they were crispy. Label your food with scary Halloween names such as fright night drink, witch's stew, Dracula's blood pudding, Frankenstein's franks, magic potion, etc. 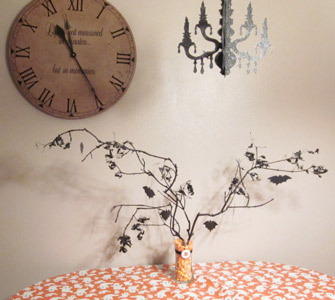 Spooky Halloween Tree - I created a spooky halloween tree centerpiece by spray painting some tree branches black. The branches I found had some old leaves on them, and I loved the look so I ended up spray painting those black too. I drew some bats out of posterboard and suspended them from the branches using fishing wire. To put the look together, I wrapped the branches with clear plastic wrap and placed it in a glass vase. 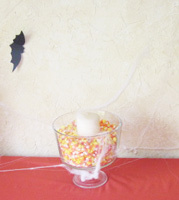 Then I poured candy corn all around the branches to fill the vase. I used black ribbon and a fun printable to finish it off. You can use the same idea for candles or other centerpieces. Halloween sugar cookies, popcorn balls, candied or caramel dipped apples, and other Halloween themed food.